We recently added a laundry room in our basement and knew we wanted to use a sliding barn style door to maximize space. 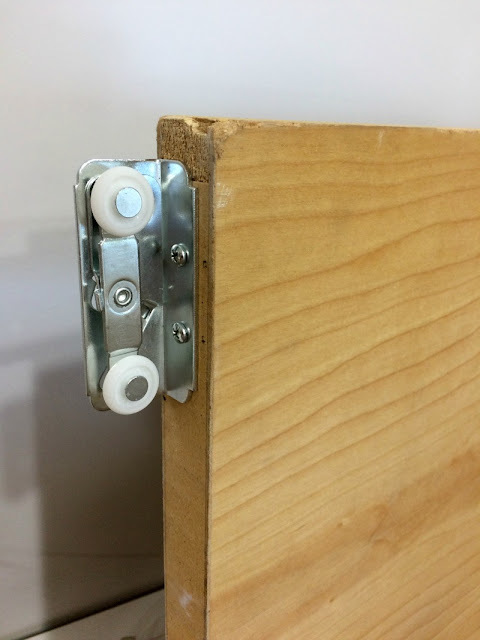 If you have shopped around, you will know that Barn Doors and the hardware to hang them with is super expensive, so we decided to DIY our own using a slab and pocket door hardware. We found a wooden slab for $15 at a local salvage store. One side of the door looked great, but the other side had a few gouges in the wood. Since the door would be open most of the time, we were fine with using it and having the back side facing the interior of the laundry room. Initially I considered painting it white, but I fell in love with the wood grain and decided to keep the natural look. 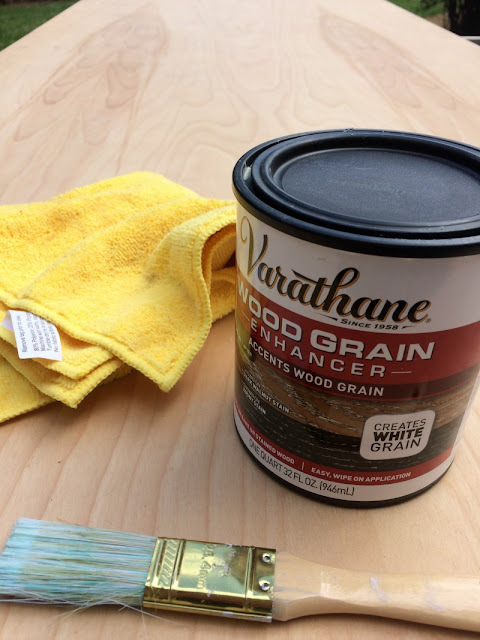 I used Varathane's new Wood Grain Enhancer to bring out the beautiful grain. We also found a large pull at the salvage store for a few bucks that we are using for the handle. 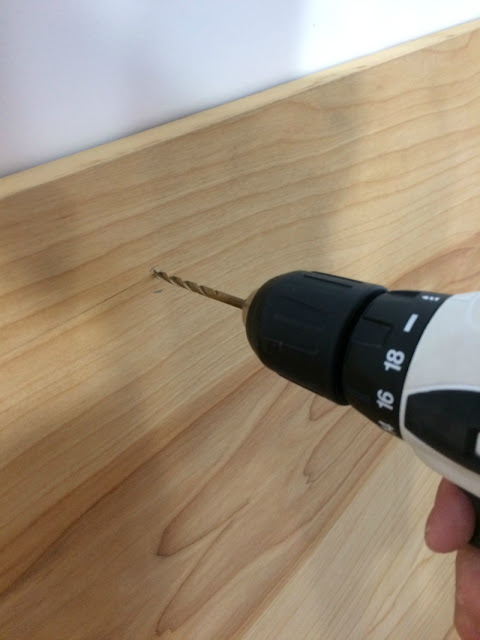 We just measured where we wanted it to go, marked the holes with a pencil, and pre-drilled the holes for the hardware. We considered multiple options to use for the track and hardware to hang the door. 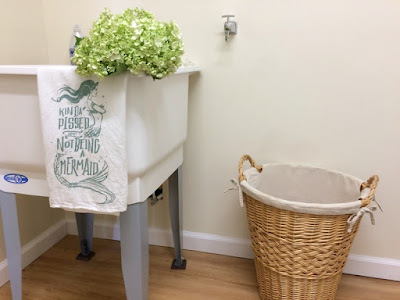 If you search on Pinterest, there are tons of DIY options for making your own track....from plumbing hardware to flat metal and pulleys and other ideas. 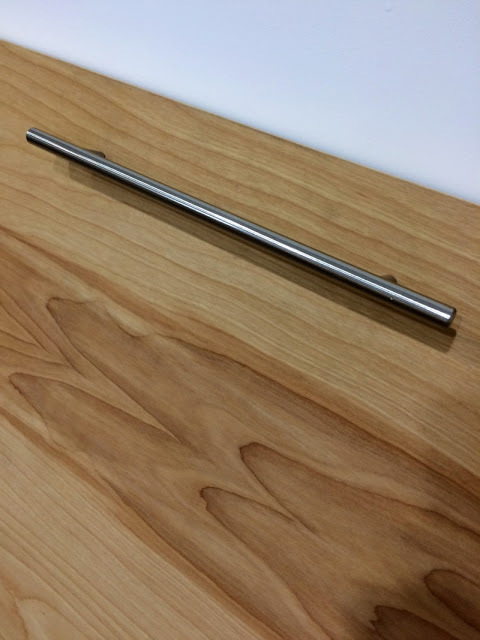 We ultimately chose to go with a pocket/pocketless door hardware kit that mounts to the ceiling for a streamline look. It was easy to install and came with everything we needed from the track to the rollers to the door stops and it was inexpensive. 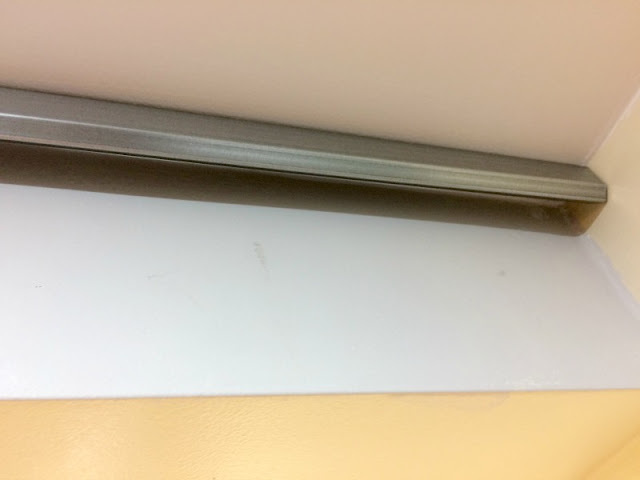 Create a template made of paper to ensure accurate placement of the rollers on the top of the door. 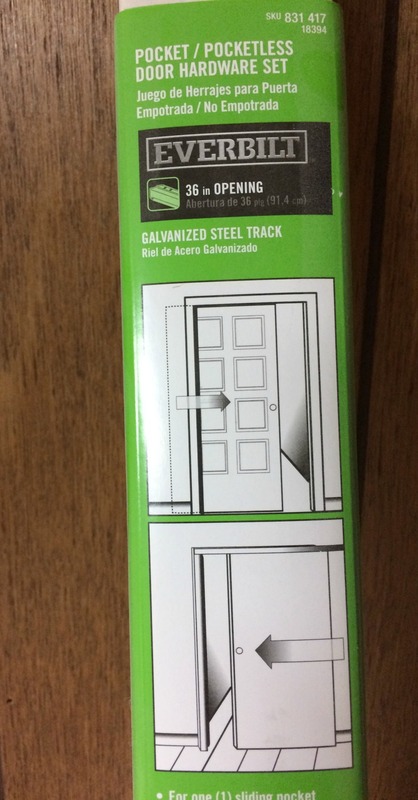 The instructions recommend placing the hardware so that the rollers are directly in the center of the door. 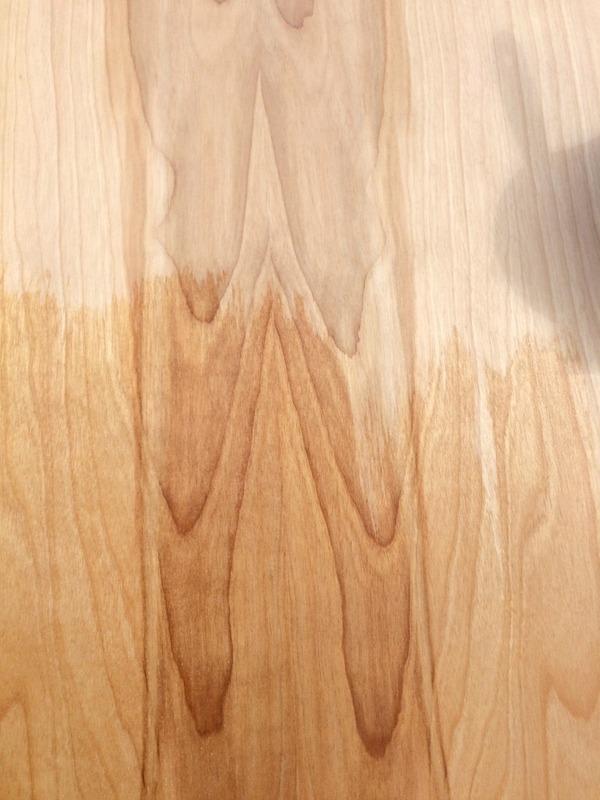 We also placed them about 1/2" from the outside edge. 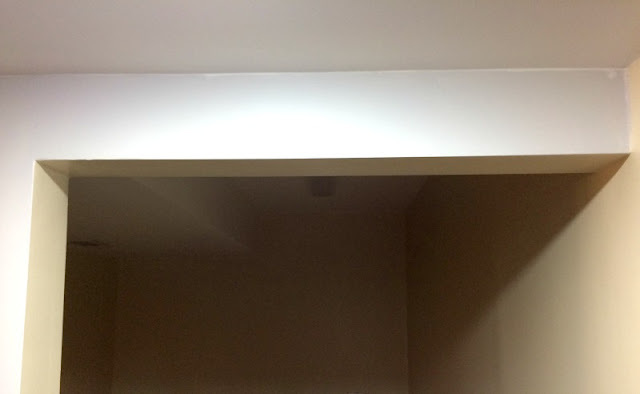 Since the track hangs from the ceiling, you will probably need to attach it to a 2X4 instead of directly to the ceiling so you do not have 3" of clearance under your door, unless you have a custom cut door. As you can see below, we initially attached the track to the ceiling, but had to take it down and add a 2x4, then mount the track to it. Either way, you will want to add some type of molding to cover the track. Make sure you measure the rollers that mount to the top of the door for the clearance you need from the wall. (Confession: We did not do this the fist time, and we had mounted the track too close to the wall. #DIYfail) Luckily it was an easy fix to just move the track out 1/2 an inch. This door makes such a big impact and looks expensive even though we spent less than $75 total. Where could you use a barn door in your house? Check out the finished Laundry Room Here! 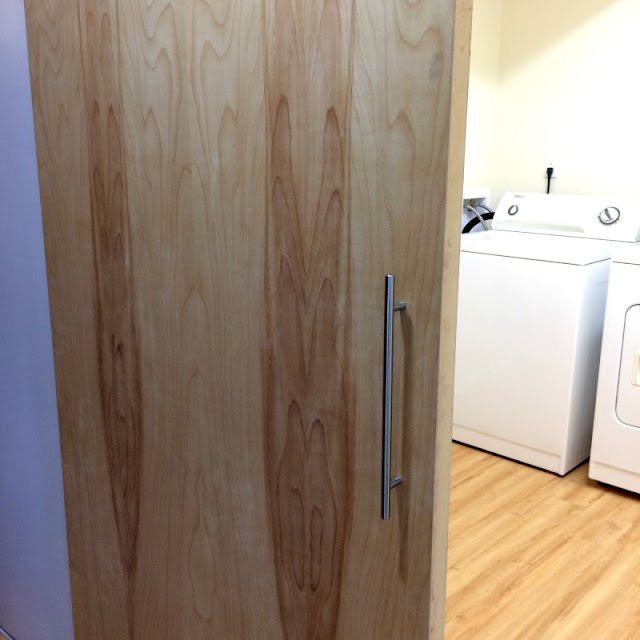 I would love to add a door like this to our laundry room. I need to put this on my 'to do later' list! Haha! It looks so nice! It is really not to hard to do and saves space too! This turned out so cute! We made a sliding barn door in out house too! I love barn doors! Thank you! I want to do another now! 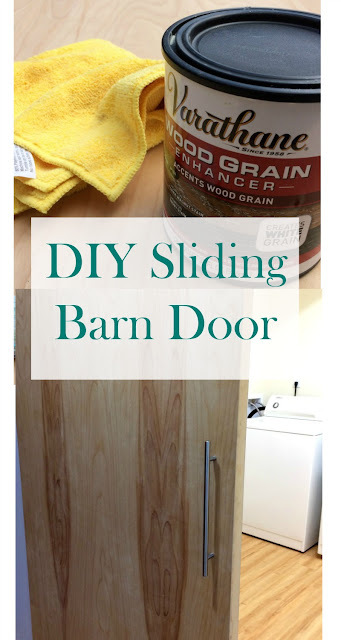 That's great that you created your own barn door! I'd love to add one to my home. Great project! Thanks! It really was not too hard and much cheaper than buying one! wow great job it looks great! Great job on your door. We replaced the laundry room and pantry doors during our kitchen remodel with barn doors. Just love them. Real space savers, too. Thank you! We love the barn door style too!